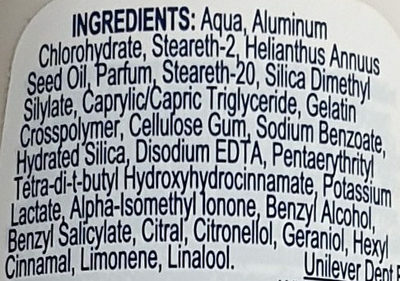 Aqua, Aluminum Chlorohydrate, Steareth-2, Helianthus Annus Seed Oil, Parfum, Steareth-20, Silica Dimethy Silylate, Caprylic/Capric Triglyceride, Gelatin Crosspolymer, Cellulose Gum, Sodium Benzoate, Hydrated Silica, Disodium EDTA, Pentaerythrity Telra-di-t-butyl Hydroxynydrocinnamate, Potassium Lactate, Alpha-lsomethyl lonone, Benzyl Alcohol, Benzyl Salicylate, Citral, Citronellol, Geraniol Hexyl Cinnamal, Limonene, Linalool. Product added on February 10, 2019 at 8:31:09 PM CET by sil. Last edit of product page on February 11, 2019 at 11:00:16 PM CET by sil.